At Australia's Royal National Park, you can go bushwalking and whale watching in the same picturesque location. 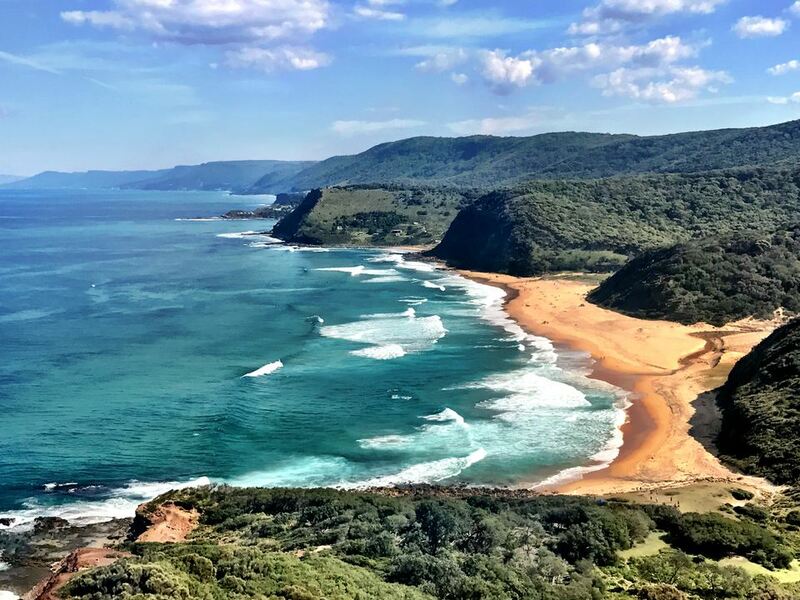 Located just south of Sydney, New South Wales, in Sutherland Shire, Royal National Park (the Royal to locals) captures some of the most breathtaking views in Australia. With a range of activities including bird watching, hiking, fishing, surfing, and camping, you control the tempo of your vacation. The Australian government designated the world's second oldest national park in 1879. At 16,000 hectares (almost 40,000 acres), the diverse landscape changes from beach to grasslands to rainforest. Wildlife ranging from possums to wallabies, bats to reptiles, live in the park environs. And more than 300 bird species, including pelicans, have been documented. Plan a visit to Royal National Park during any season. Spring brings wildflowers, summer is great for the beaches, and whales pass by in winter. March tends to be the wettest month, and temperatures vary throughout the year from lows in the 40s F to highs in the mid- to upper 80s F.
There are barbecues and fireplaces available for public use within the grounds of the park, and you can also bring your own portable gas barbecue. Particularly during the dry Australian summer between December and February, it’s important to follow any rules in place regarding fire bans or warnings. All Aboriginal sites and rock formations, including fauna and flora present in the park, are protected, and may not be taken out of the park. Park management prohibits firearms and spearguns. You must also leave your pets at home, to protect the wildlife. And be sure to pack out everything you bring in, including trash. The Royal National Park is generally a safe place but you should still exercise some caution and avoid potentially dangerous situations. Don't walk on the edges of precipices, or in any place a landslide could happen. When boating, wear an appropriate safety flotation vest. On longer or steep walks, bring enough drinking water to avoid dehydration. And if there have been fire bans or extreme fire-danger warnings, refrain from walking on trails situated away from roads or main visitor areas. Traveling to the park is easy, and you have several options to get there. To use the train, take the Illawarra Line. This transports you to Loftus, Engadine, Heathcote, Waterfall, or Otford, and then through the walking tracks and into the park. On Sundays and public holidays, a tram is available from Loftus. If you’re driving, there are three road entrances into the park. The first takes you via Farnell Avenue off the Princes Highway 2.3 km (a little less than a mile and a half) south of Sutherland (29 km or about 18 miles south of the Sydney center). The second is through McKell Avenue, off the Princes Highway at Waterfall, 33 km or just more than 20 miles east from Liverpool. The third is through Wakehurst Drive in Otford, 28 km or about 17 miles from Wollongong. You can also reach the park by boat along the coast and through the Hacking River below the causeway. Ferries come from the beachside suburb of Cronulla to Bundeena.